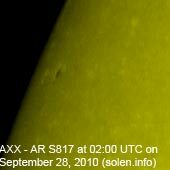 Last major update issued on September 28, 2010 at 04:10 UTC. Minor update posted at 15:55 UTC. 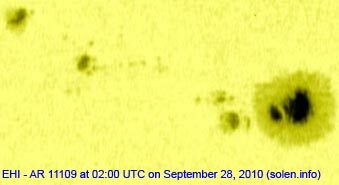 The geomagnetic field was quiet to unsettled on September 27. 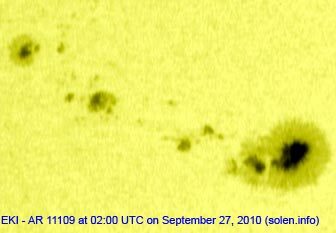 Solar wind speed ranged between 421 and 539 km/s under the influence of a weak coronal hole stream (probably from CH423). 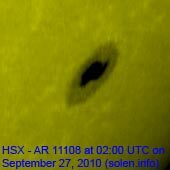 Solar flux measured at 20h UTC on 2.8 GHz was 83.0 (up 8.4 over the last solar rotation). The planetary A index was 6 (STAR Ap - based on the mean of three hour interval ap indices: 5.8). Three hour interval K indices: 10002232 (planetary), 21103222 (Boulder). Region 11108 added a couple of trailing spots and was quiet. Region 11109 matured and lost a few spots. C flares are possible. 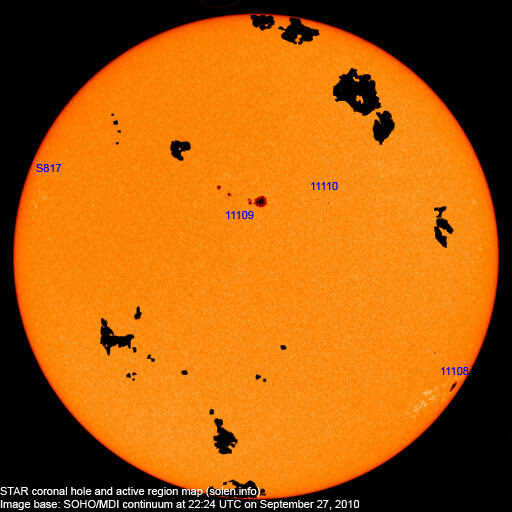 Region 11110 decayed and could soon become spotless. 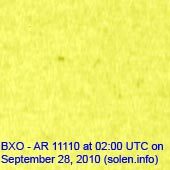 Minor update added at 15:55 UTC on September 28: Region 11110 has developed quickly today as new flux emerged, currently 7 spots are visible. 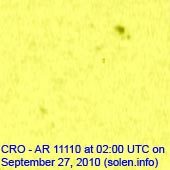 The region was the source of a C1.7 flare at 09:48 UTC. A new region has emerged near the northwest limb and currently has 2 spots. 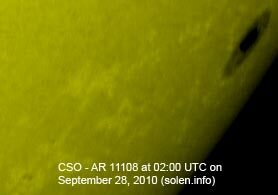 September 25-27: No obviously Earth directed CMEs were seen in LASCO or STEREO images. 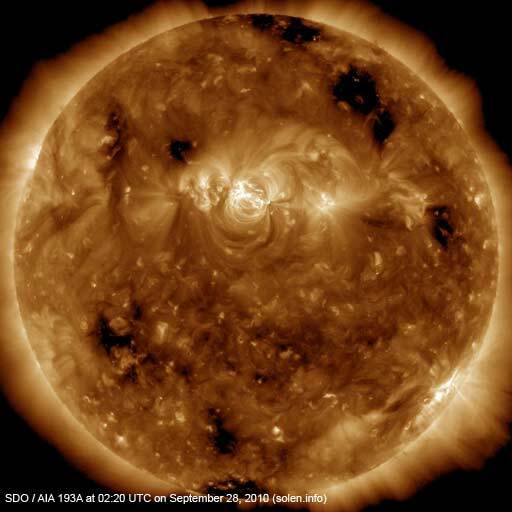 The geomagnetic field is expected to be quiet to unsettled on September 28-29 when effects from CH423 are possible and quiet on September 30-31.